The "Kirkendall" version of the surname spelling is consistent with a branch of the descendants of Cornelius that lived in Pennsylvania, from whence our James Kirkendall (1806 - 1848) came to Ohio. 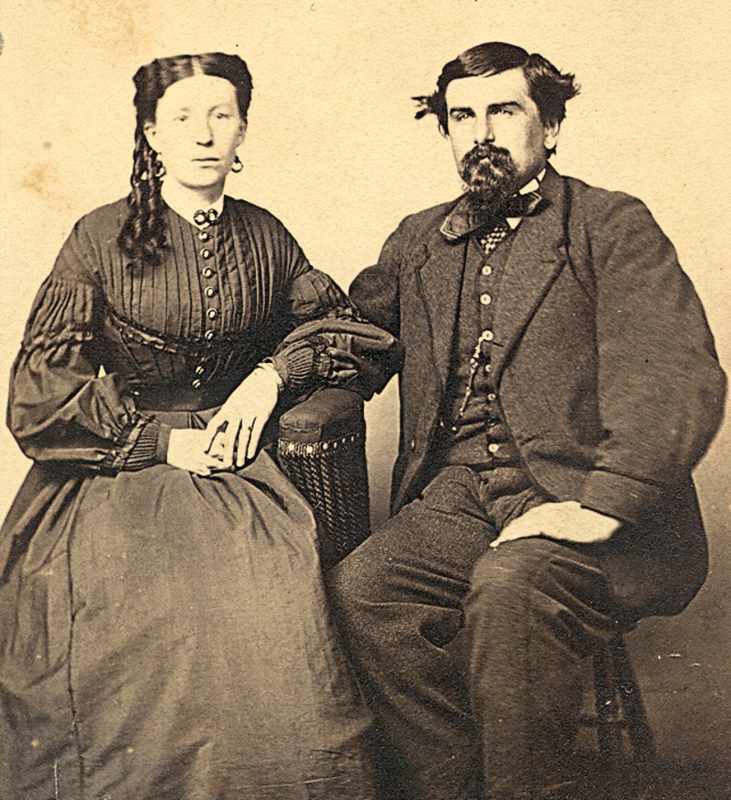 Caroline Larimore and James W. Kirkendall, wedding picture 1866. 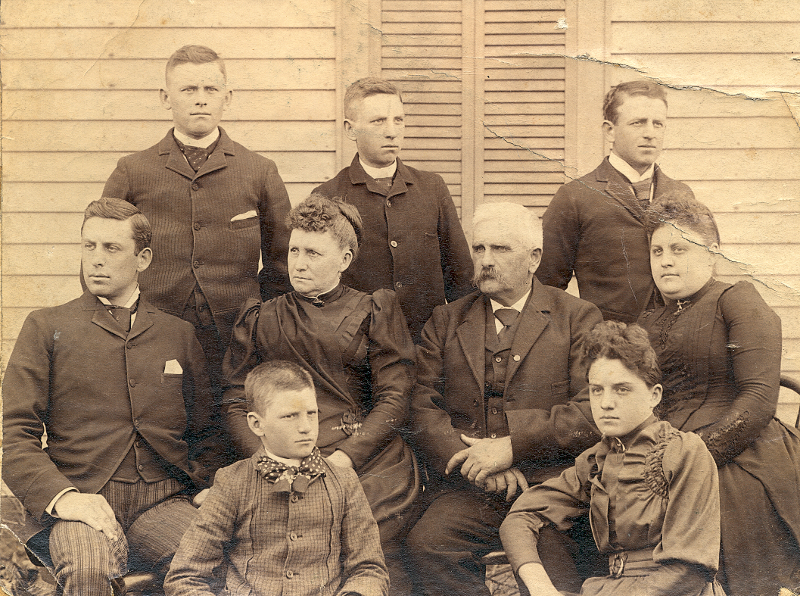 Carl, Charles "Charley", and Frank in back, James Freeman "Kirk", Caroline, James W., Louella "Auntie Lou" in the middle row, Relna and Olive in front. Relna was born 1880 so this was probably about 1890, on the same day as the "Croquet at the Kirkendalls" photo below (the clothes are the same). 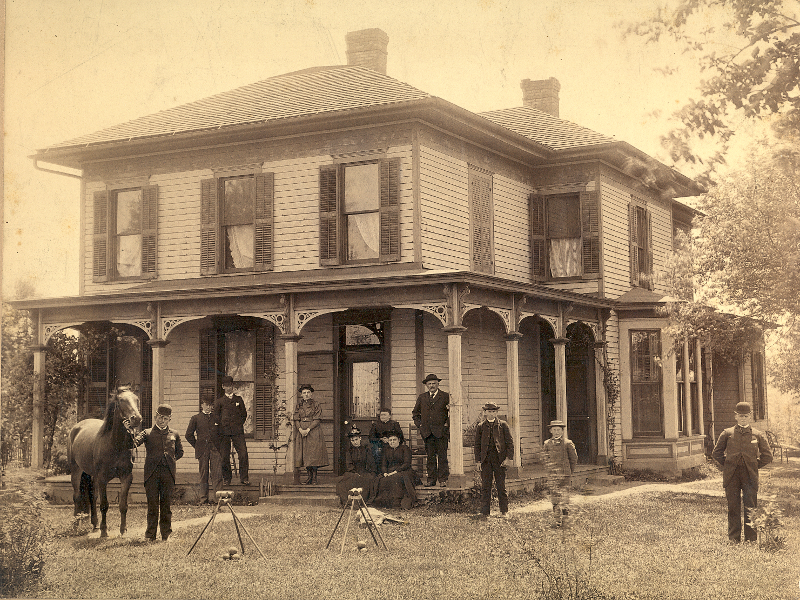 A summer afternoon at the Kirkendall home on Deeds Road, Licking County, circa 1890. 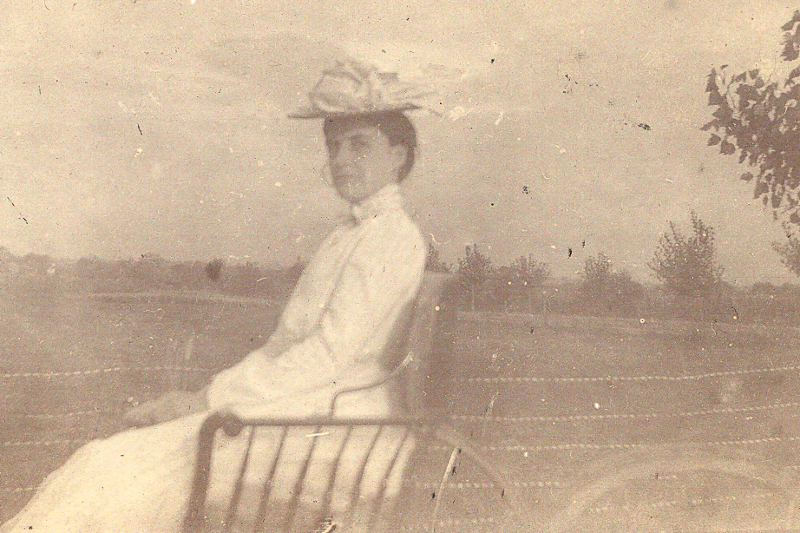 My great-grandmother Olive Kirkendall, born 1878, is standing on the porch, as is Capt. Kirkendall at the corner of the house. Seated by Capt. Kirkendall is his wife Caroline, and in front of her are seated Alice Pagett (apparently Capt. Kirkendall's half-sister) and daughter Louella. The five Kirkendall boys are standing in the grass and a man who may or may not have had some relationship with Alice Pagett is standing on the edge of the porch on the left. The railroad crosses Deeds Road on the west edge of this property, and the Kirkendall boys were known to jump the train as it passed by, and ride it to Outville, contrary to their parents' rules. The J.W. 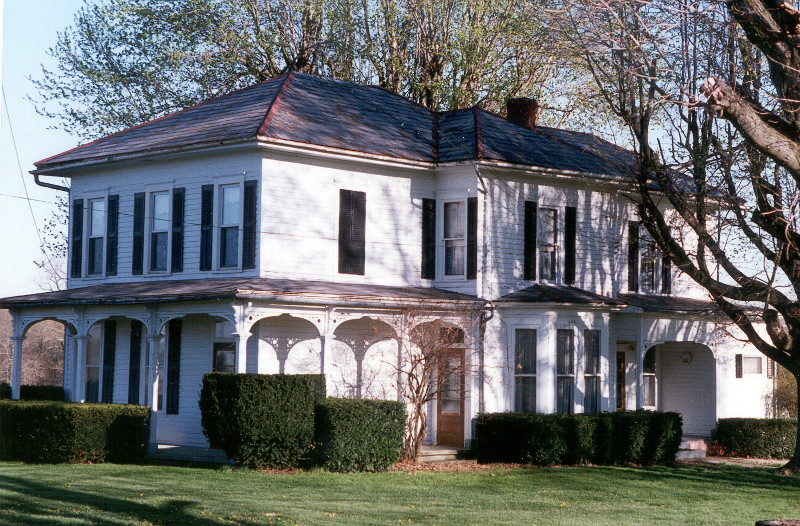 Kirkendall house on Deeds Road, Harrison Twp, Licking County, 1999. Olive Kirkendall sitting on a horsedrawn wagon, photographed by Archibald Rodgers in the general timeframe of their 1904 wedding. Their courtship lasted 4 years while Arch's parents sent him on a trip around the world, in hopes that he would find a more suitable bride than the farm girl from Licking County. Arch owned an early personal camera, and left photos of his world tour. Unfortunately the quality reflects the primitive state of the consumer film of that era. 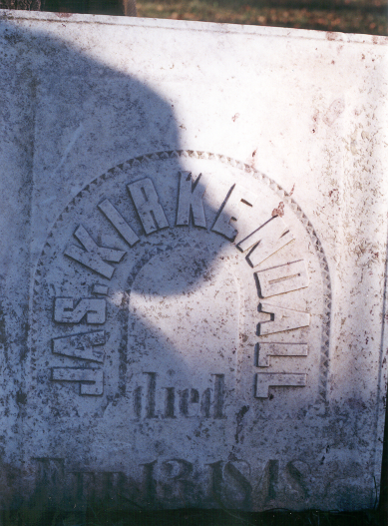 Headstone of James W. Kirkendall (Sr.), 1806 - 1848, born in Pennsylvania, died at Kirkersville, Licking County, Ohio. His ancestry undoubtedly traces back to the original Luur Jacobszen Van Kuykendaal of the Hudson River valley Dutch settlers, but I have no idea who his parents were or where in Pennsylvania he originated. Capt. James W. Kirkendall's daughter Louella never married, and lived with her sister Olive and Arch Rodgers at their Valleyview (Columbus) home. 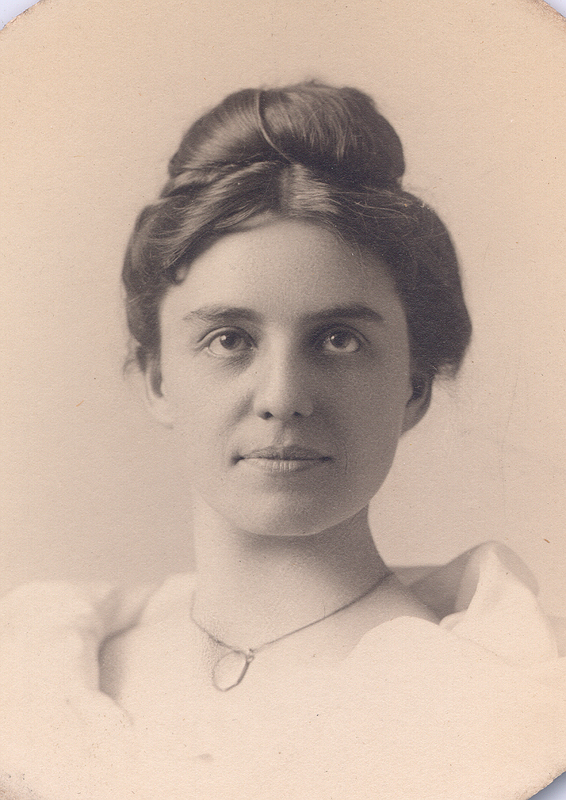 She worked at the Odd Fellows Home in Columbus. 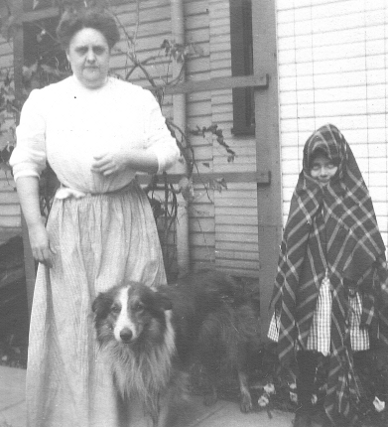 Here she is at the Valleyview house with the family dog "King" and my grandmother, Olive K. Rodgers, about 1912. She was known as "Auntie Lou" to my grandmother and my mother, and lived until 1939. A leather-bound calendar/memo booklet bears the signature and military unit of Capt. Jas. 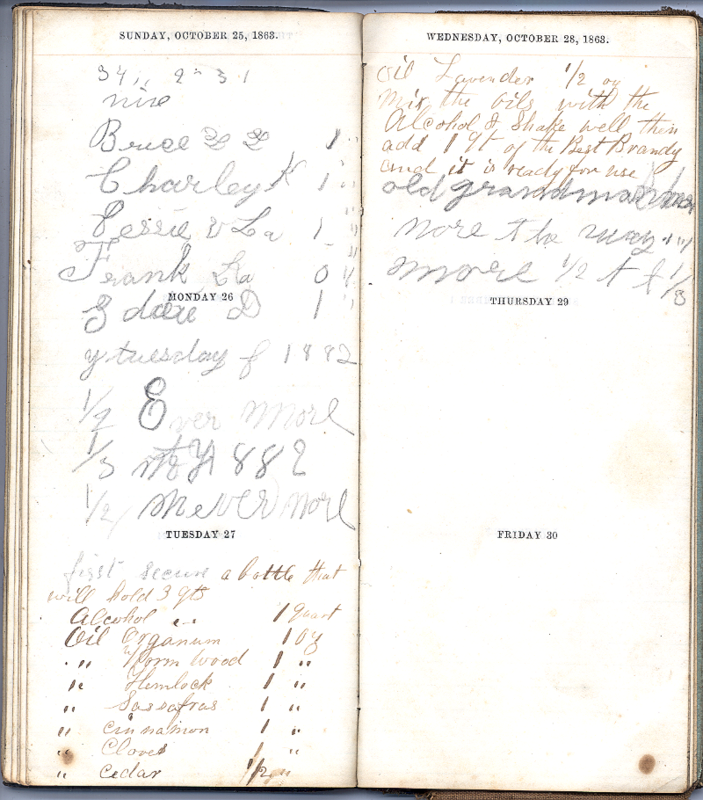 W. Kirkendall on the inside cover, but appears to have been shared by others, including a child at some point. Since his mother Delilah kept the general store at Kirkersville during and after the Civil War, and judging from the scale of this medicine recipe, a reasonable guess is that this is for a volume of medicine to be re-packaged in smaller bottles for sale in the store. With hemlock as an ingredient, it must have been for topical application. 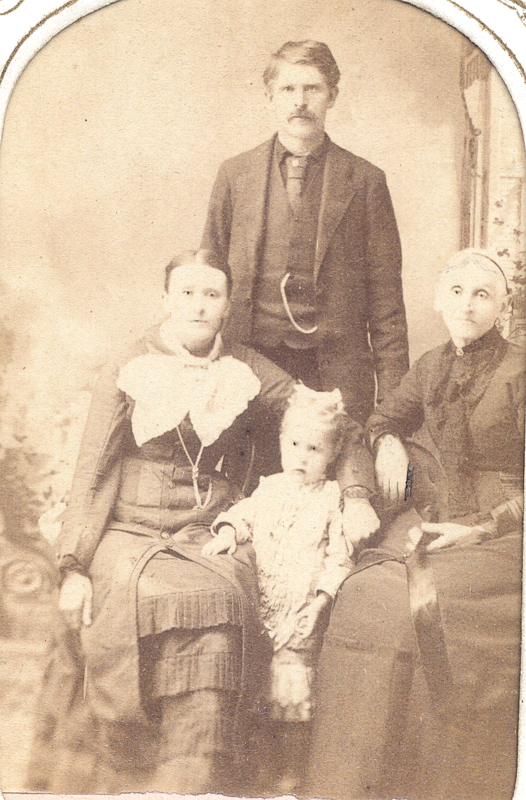 Olive (Kirkendall) (Thomas) Lyon (1837 - 1911), her son Freeman "Free" Thomas Jr, (1854 - 1916) and his daughter Jessie (1879 - ? ), with Olive's mother Delilah (Gilmore) Kirkendall. In the family Bible this photo is annotated that the child was Free Thomas Jr. but that could not be correct -- he was born in 1854 and a photograph such as this was not possible until after the Civil War. Probably it was closer to 1883 -- Jessie appears to have been about 4. Olive Kirkendall and her first husband Freeman Thomas migrated west from Ohio sometime between the birth of Freeman Jr. and the 1860 census, when they are found in Coffey County, Kansas. Freeman Thomas Sr. apparently died in the mid-1870s as she remarried, to Saul Lyon, in the 1877 timeframe. Due to circumstances unknown to me, it appears that the Free Thomas Jr. family broke up before the 1900 census. In that year, his two children Jessie and Eugene are found living with Olive and Saul Lyon in Denver (Jefferson County), Colorado. Free Thomas Jr. remarried about 1903 to the widow Caroline K. Coyle, according to the 1910 census, Eugene, Oregon. He died there in Eugene in 1916 and is buried along with his mother in the Eugene Pioneer Cemetery, in unmarked graves. 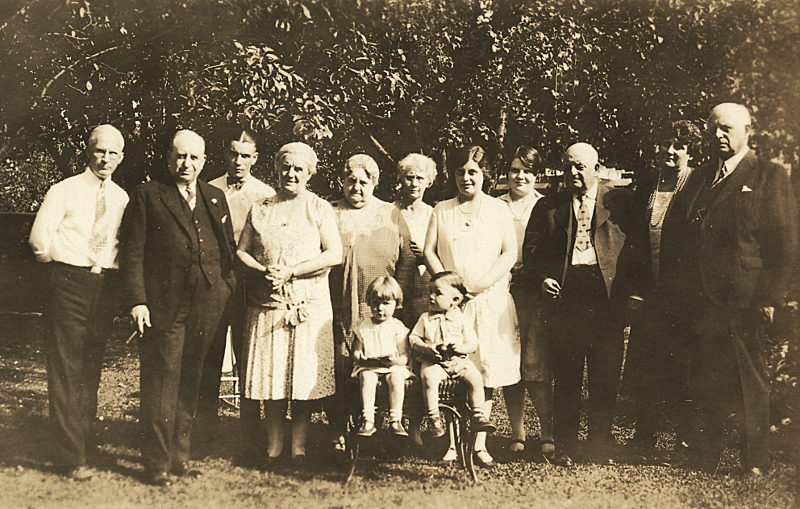 Arch Rodgers, Carl Kirkendall, Earl Wendell, Olive (Kirkendall) Rodgers, Louella Kirkendall, Elizabeth (Fisher) Kirkendall (Frank's wife), Olive (Rodgers) Wendell, Eliza Rodgers, Frank Kirkendall, Hazel (Woods) Kirkendall (wife of James F.), and James F. "Kirk" Kirkendall. Olive and Earl Wendell are the children, dating this photo to about 1929. Interestingly, of Olive (Kirkendall) Rodgers' 5 brothers, these three were all shoe salesmen.